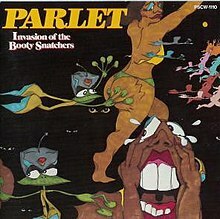 Invasion of the Booty Snatchers is the second studio album by the P-Funk spin off group Parlet. Released on May 15th, 1979, this was the final Parlet album to feature Mallia Franklin (on three songs) and the first to feature Janice Evans (on two songs). The album was produced by George Clinton and Ron Dunbar. The highest charting single from Invasion of the Booty Snatchers was "Riding High" (written by Ron Dunbar and Donnie Sterling).